Military jackets are very trendy right now. Last fall I made plans to make one, but didn’t get around to it until now. I used a thick cotton twill in aubergine from MoodFabrics.com. It was easy to work with and has a great woven texture which you can see in some of the close ups. This was the only design I liked from the May 2011 issue of Burda style. It is chalk full of interesting details: 20 buttons!, topstitching, sleeve cuffs, shoulder tabs, folding back front lapels, slanting back yokes and back belt. I opted not to trim it in bias strips per the instructions. I also added a full lining and shoulder pads. After making a muslin, I added 1.5″ to the overall length at the waist and .75″ to the center back seam. The front dart was altered to slant up a bit. Both the inner and outer collar were fused with interfacing. Since my fabric was fairly thick, I left off all other interfacing suggested in the pattern instructions. I did iron small squares of it to the inside where the buttons were sewn on. I moved the buttonhole placement on the cuffs over to 5/8″ from the edges. The back belt buttonholes were also stitched 5/8″ from the edges. I initially had some trouble finding buttons for this jacket. I knew I wanted a military crest of some sort, but all of the ones I looked at locally did not have their crests attached the same way on each button, resulting in the crests facing all different directions. For the first time ever I ordered buttons online. These also came from Mood. The buttons on the shoulders, back belt and sleeves are the 20mm size. The ones on the front are 23mm. I really love how the sleeves have built in forward curves to them. Here you can see the twill texture a lot better. The fabric has such a nice depth to it that my topstitching sinks in ever so slightly. 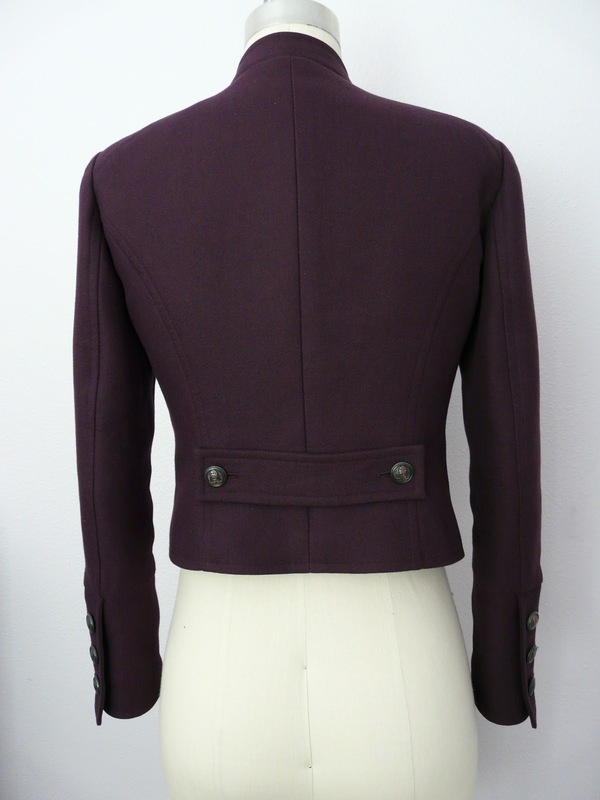 I attached the outer collar to the jacket body and sewed the inner collar to the lining. Then I stitched the body to the lining along the edges, graded the seams, and turned it right side out. I stitched in the ditch by hand all along where the collar meets the body so that none of the seams allowances could turn up on the inside and become bulky. I put a dab of fray check on the corners of the shoulder tabs after I turned them to prevent them from raveling out. The lining is bemberg Ambiance. I happened to find a really good color match locally. I had a lot of fun making this jacket. The details were challenging but not fiddly and I got to do loads of hand sewing.